Ele's Place - NPO Showcase from GRTV on Vimeo. In this week’s segment of GRTV’s NPO Showcase, Nicole Rodammer and Julie DeJong from Ele's Place share how the organization helps support grieving children who have experienced a loss of a loved one. They provide a space for support groups where peers who have experienced similar losses can meet and have a judgement-free forum to help overcome their grief. Without proper coping mechanisms, youth who have experienced the trauma of losing a family member or friend may experience depression, substance abuse, and other social, emotional and health issues as a result. Ele's Place works to mitigate the damage from the strain put on children from these experiences. In addition to providing a space for children, Ele's Place offers training and support for school staff so they can better identify students experiencing grief and can assist with crisis response in the school setting, such as the loss of a classmate. They also offer materials and trainings within the community for others looking for a greater understanding of the needs of grieving children and can provide clinical support and referrals for children in need of further assistance. Ele's Place offers a number of ways for the community to get involved including financial support, volunteer opportunities, and the donation of items on their wish list. 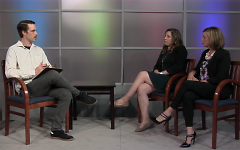 Check back next Wednesday for a new segment of GRTV’s NPO Showcase, featuring the Revive & Thrive Project.